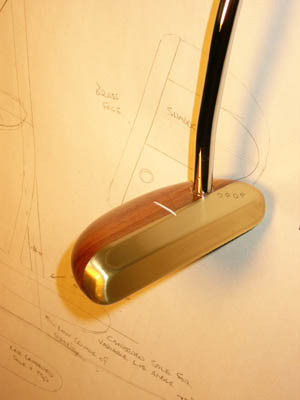 Made from rare timbers and with a brass face for a soft and balanced feel this model epitomizes the craftsmanship of the Club Maker. By having 70% of the weight forward of the shaft we have developed a unique balancing system never seen in putters before. What this means to the golfer is a more consistent strike of the ball. Having all this weight in front virtually pulls the head down and through the ball promoting a smooth balanced stroke, and as we all know Balance equals Control. 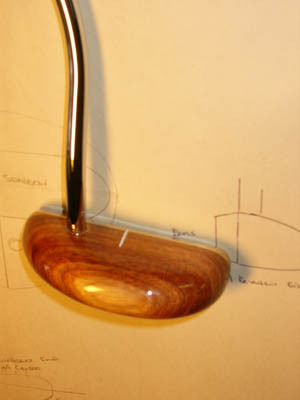 The Top Drop is available in 2 styles: Mallet and Indented. These are strictly aesthetic, both types perform equally on the greens.